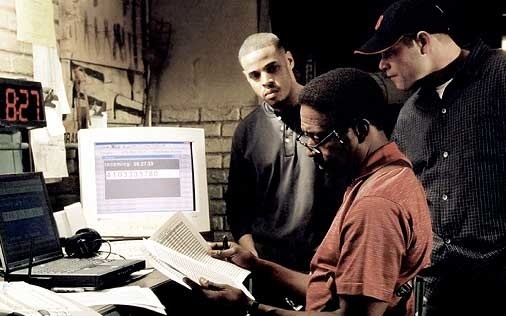 I recently began to watch The Wire for the first time. The series is one of the most discussed in academia, and I and a few other budding media scholars decided we had to rectify our lack of knowledge of the show. The catch-up plan was part entertainment and part edification. Though I didn’t begin watching completely ignorant of the narrative and setting, I spent much of the first season questioning when the action takes place. Only after a reference to September 11 did I fully accept that it was set during the early 2000s. 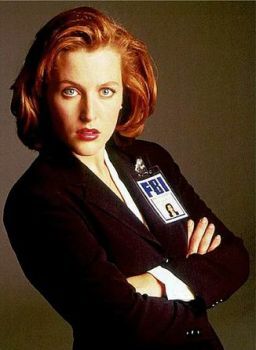 To my eye, much of the mise-en-scène–especially female costumes and hair–seemed straight out of the mid-1990s. Most clearly, the character of Asst. 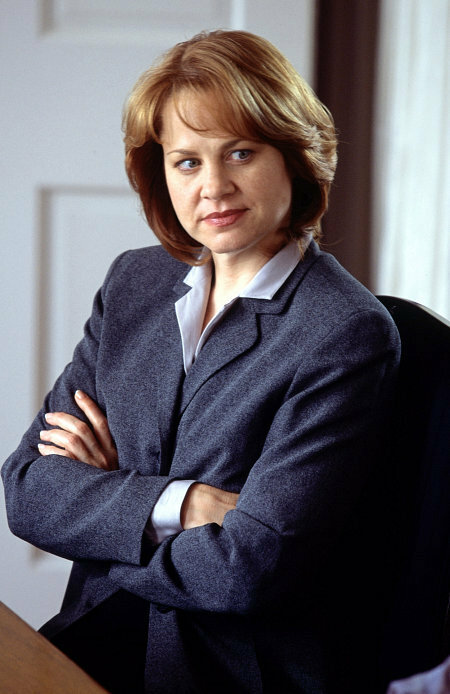 State’s Attorney Rhonda Pearlman looked like she was styled as if she were Dana Scully‘s sister. Maybe the style of women-of-authority hasn’t changed much in the years between these two shots, but I think it runs deeper than that. 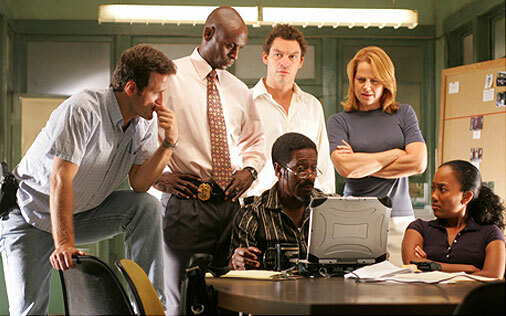 The ostensible time-lag on The Wire may be another element of the show’s much-heralded realism, but I think it also speaks to the show’s portrayal of class both within and of the city of Baltimore. The sense of lagging chronology is explicitly discussed on the show in the first season, with police officers complaining about having to fill out paperwork on typewriters (though this apparently still occurs) and discussing why the drug dealers use beepers instead of cell phones. Despite these explanations of the use of old technology, its presence still adds to my sense of time displacement. The computers used for the wiretaps in the first season are massive and clunky, looking more like my old Windows-97-running desktop than what I’d imagine law enforcement to have. But, I think that may be the point. The Baltimore police is embattled and the group investigating the Barksdale drug ring even more so. Each police officer and piece of technology on the detail has been fought for and begrudgingly won from the higher-ups in the department. They are given the least-valued people and equipment as a marker of the investigation’s low status. Beyond the costuming and props, some of the camera shots from the first season also seem rather mid-nineties. Perhaps it is David Simon’s Homicide influence or someone just thought it would look cool, but the first season featured a few cuts from shots framed in a more standard television-realist mode to feed from a nearby surveillance camera. While Simon attributes this style to wanting to convey the panoptical oppression of the wire, it’s a method I associate more with 1990s television procedurals that were still fighting for the attribution of realism. Moreover, I don’t entirely buy Simon’s interpretation of the surveillance shots because so much of the first season deals with how little the police actually know about Barksdale and how difficult it is to obtain even that information. Despite the presence–and highlighting through cinematography–of surveillance equipment, there is no real sense of police omnipresence among the criminals. The panopticon isn’t at work in Baltimore. Bodie can break the surveillance camera in broad daylight because he has no fear of authoritarian consequences from the video watchers. He knows the camera isn’t actually linked to any kind of police power. The security cameras so highlighted seem obsolete, as if they were established in order to create the panoptical gaze often attributed to CCTV but without any follow-through of punishment. In addition to the time-lag corresponding with bureaucratic status, the technology, fashion, and camera shots seemingly from a bygone decade give the viewer the sense that the mid-nineties didn’t make it to Baltimore until 2002, which inherently places the city as a whole in a lower class than other American cities. Of course, discussing class on The Wire is inextricably linked to race, and as such I must examine my own expectations and biases. While much of my musings on fashion focuses on white women because that is the fashion genealogy I know, I found fewer male costume choices as examples of a classism-tinged temporal lag. The time-markers for the black male characters often corresponded to clothing branding–such as Sean John, RocaWear, Phat Farm, and the like–that fit with a very specific time in the early 2000s, but in terms of cut and style of wear, I am unable to see changes as I can with women’s wear. 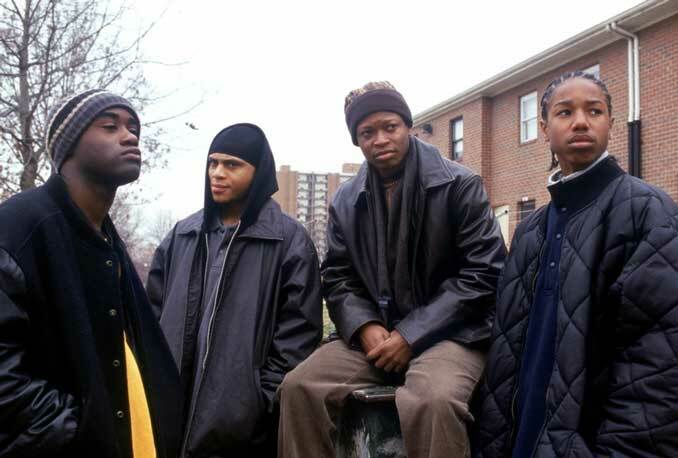 Maybe I can’t see it because I don’t know it, or maybe there is less chronological dissonance the styles of The Wire‘s black drug dealers because their image is so tied to a lower class that their style choices fit with the lower-class portrayal of Baltimore. While I know that Beadie’s look from the second season (below) is dated because I lived through the time when the stick-straight flipped-out hair was “in” and I may have owned a similar sweater tank top in the 1990s, I simply don’t have the cultural memory or knowledge to place D’Angelo’s, Bodie’s, or Wallace’s dress (above) in a specific point of the last two decades. Baltimore, as a city, is often portrayed as dying, and many of the establishing shots of the first two series are of boarded-up, condemned, and abandoned buildings. Most of the police homes we see are lower-middle-class, and their investigations in the first two seasons center on the projects and the docks without straying too far from those class barriers. Though I’m only a few episodes into the third season, that seems about to change with the advent of the “political” season. But the groundwork has been laid. As The Wire moves beyond the lower classes in narrative, so too do they appear to move beyond the 1990s in mise-en-scène. The technology is newer and the clothing is more time-appropriate. Yet this movement supports my argument that the time-lag presented by the mise-en-scène of the early seasons links to Baltimore’s lower class both as a characteristic of the city as a whole and as a segment of its people surrounding the investigation. Last week, Starz dropped the axe that many of us knew was coming when they canceled Party Down, a brilliant comedy that reached most of its audience through Netflix Instant Watch, which streamed new episodes the day after they aired on Starz. I consoled myself that Party Down could at least live on and gain admirers through it’s presence on Netflix’s streaming service. Then, it was reported today that all 20 episodes of the show will be removed from Netflix tomorrow. Someone who knows more about distribution and business models featuring streaming content will perhaps ask and answer the questions many fans of the show have: What metrics are used to mark viewership on third-party sites like Netflix? Did Starz or Netflix make money off of the deal? Why would Netflix be taking it down only a week after the series cancellation? And what does Martin Starr need to do to make it to 22 episodes on a series? I can’t offer answers to those questions, but I can highlight one of the show’s most intelligent thematic motifs: the use of theater tropes. The first scene of the first episode is of Ron Donald (Ken Marino) directly addressing the camera, making his pitch as Party Down team leader, ostensibly to the audience but in reality to that week’s party host. It’s a monologue disguised as a soliloquy, laying out the exposition of both the situation and of Ron as a character. Moreover, it establishes an unstable relationship with reality. Though Ron is the only caterer of the crew without Hollywood aspirations, his monologue underlines the “All the world’s a stage” theme of Party Down. While he is putting on a show for his client, the series begins down a path that will develop just how many “shows” are being put on in the world of Party Down. The show doesn’t occur in a “real” world, but instead it’s characters are constantly performing themselves and their Hollywood dreams in the world of theatricality. In “Investors Dinner,” Constance (Jane Lynch) brings in Baretta‘s prop gun to settle a bet, then right before the act break, the scene from the above clip happens followed by Casey (Lizzy Caplan) saying, “Well you know what they say about a gun in the first act, Ron.” While Casey understands the absurd world she’s living in enough to make a reference to Chekhov’s gun, Kyle response, “What act?” There are varying degrees of self-awareness of the theatrical elements of Party Down, but even Casey doesn’t expect the gun to actually play a dramatic role in the final act of the episode. The party is revealed to be an investment scam, with two con men/actors playing their roles in the presentation and Ron pretending to be a tough action hero because he knows the gun is fake. All of the masks the actors wear are eventually broken in a fittingly theatrical reveal, as if the show suddenly became a dinner-theater whodunit, but with the shyster getting away with it and the “hero” cleaning his own pee off the carpet. In Party Down, this level of theatricality does not break nor bend the show’s verisimilitude, fitting well into a world where the absurd expectations of a theatrical world have become normalized. Baretta’s gun has become Chekhov’s gun, and Roman has become Bacchus for a night. These metamorphoses work because the show’s foundation is the stage, one that has been built stronger with each episode. Monologues, acting–conscious for work, schemes, pranks or unconscious for self-preservation in a sad life–mistaken identities, reversals of fortune, and discovery abound with each new party the group caters. “Cole Landry’s Draft Day Party” turns into a melodramatic farce with secrets revealed and a reversal of a reversal of fortunes, and “Steve Guttenberg’s Birthday Party” revolves around a script workshop and read-through, with Steve Guttenberg playing a version of himself amped up enough to be read in the fifth (or fiftieth) row. And like some theater, Party Down will only be accessed and loved by few people. But perhaps that’s part of their struggle.